If you have a child in elementary, middle or high school in Illinois, then you need to know about the standardized tests your child will be taking. To comply with the federal No Child Left Behind (NCLB) Act of 2001, Illinois administers standardized tests to students beginning in 3rd grade through high school. Time4Learning, an online education service that teaches many of the skills these exams test, offers this page to help you understand Illinois’ standardized tests and how you can help your children prepare. In Illinois, students in 3rd through 8th grade take a standards-based test called the Illinois Standards Achievement Test (ISAT). Standards-based means that test items are based on grade-specific Illinois academic content standards. The ISAT tests third through eighth grade students in reading and math. Students in 3rd, 5th, 6th and 8th grade also take a writing test, while students in 4th and 7th grade take a science test. In addition, schools can choose to administer ISAT tests in physical development and health, social science and fine arts. Illinois also administers the Prairie State Achievement Examination (PSAE), another state standards-based test, to students in 11th grade. The PSAE tests students in reading, math, science and writing. The PSAE is combined with the ACT college entrance exam and two ACT WorkKeys assessments. The ACT test measures students’ knowledge in math, science, reading, writing and English to ascertain whether they are prepared for college. The ACT WorkKeys assessments determine if students are job-ready by testing their reading and applied mathematics skills. PSAE test scores are not a requirement for promotion or graduation. However, PSAE scores are included on high school transcripts and show which students earned Prairie State Achievement Awards for excellent performance on the test. ISAT test scores alone do not determine if a student will be promoted to the next grade or held back. However, students who receive low scores in reading, math, science or writing might need additional instruction in those subject areas. 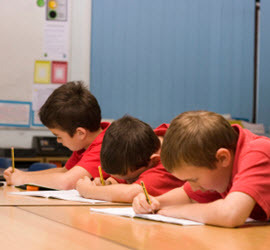 To help your children prepare for state standardized tests such as Illinois’ ISAT, you can enroll your children in a test prep program or buy books to help them become familiar with test formats and terminology, to learn test-taking strategies (when to guess, when not to), to become comfortable with time restrictions, and to practice answering different types of questions.